Let's talk about some pros of the announcement for boys first. Guys who don't feel smart enough to go to college and have nothing to do after graduation will no longer slip through the cracks. Not to say that they all do, but I can think of one I know personally who just never made it out in large part due to that gap. Now they'll have the opportunity to get out and serve. Other than that minority (and a few others who are just eager to get out instead of spend a year in college), the boys' change isn't completely unexpected. There are plenty of guys who wait to go on their missions (I also happen to know a few of those) because they want to feel more mature and/or prepared first. I don't think that will change. Biggest con there is maturity, but Pres Monson pointed out that going at 18 is an option, not a requirement. In case you missed that. Now for the big change - girls. Do you have any idea how much happens in two years? So many girls get married, get too involved in school or careers or any number of things between 19 and 21. I started thinking about a mission when I was 20, and I had to wait a whole year to turn 21, and an additional 4 months after my birthday to go into the MTC. There, I waited 2 more months... I was quite pleased to read the Newsroom article stating that they plan to cut down MTC time as well. (I always felt my last week or so was more review and anxiety than anything else.) Total, I did 18 months of waiting to serve my 17.5 month mission. Now, looking back I wouldn't change my time there for the world. I love my companions and the people we met and taught, and being there earlier would have change a lot of that, but I would have been so pleased if this announcement were made in 2006 when I was pondering missionary service. Between sessions, Casey (DH) and I went to Subway for lunch. We stood in line behind a very excited girl telling to her friends that thanks to the announcement, her whole life had changed and her papers would certainly be in by January. One of my friends posted on facebook that she will definitely serve in one year when she turns 19. Another friend was going to turn hers in next fall, but now has the option of talking to her bishop at the earliest convenience. These changes are huge to girls and to missions. (Rosarinos, correct me if my numbers are off.) Most transfers, my mission (Rosario Argentina!) only had about 15 sisters out of a total of 150+ missionaries. There would be plenty of transfers where we would lose sisters and not get any new ones. We'd try to find mini-missionaries (locals aged about 18-20 who would be missionaries for a transfer or two) to keep areas open, but it's a total crapshoot. Many areas in my mission just needed sisters. No offense, elders, but it's just true. I served in one area where a bad pair of elders had thrown a party and the members had no respect for elders. They refused to take boys if the President tried to send them. The change in girls' age requirements for missions will not only get excited girls out there sooner, but plenty of girls will be getting the maturity and experience they need in the mission field instead of getting married to the first RM they date. A friend made the point that this will also close the awkward dating gap between male and female RMs. Female RMs had plenty of time to date and when they get home they generally know what they want. Male RMs generally have had little, if any, time to date pre-mission and make for awkward and uncomfortable dates for a while post-mission. Long story short, my mission had a huge effect on me and I'm stoked to see missions change the lives of many, many more young women than they have in the past. I think it is so exciting! I wasn't ready at 19, but so many young women are and I think this is a very positive change. I've seen some real bonehead comments about how the church is forcing guys to go younger and that the sisters will be attracted to the elders, etc. Completely forgot the part where each individual is in a position to receive personal revelation and this is merely an option for those that would like to go sooner (especially the ladies). Always enjoy your blog. Love you sweetie! Thanks for pointing out personal revelation... and really the age drop for guys is more so guys who live in countries where military service is obligatory (I believe someone said South Korea is one such country, and guys must enter the military when they are 20) can serve missions before fulfilling duty to country. Not for us imperfect weirdos to push young, immature boys into missionary service. A couple of things: 1 - Maturity. This should be gauged by the Bishop, the parents, and the individual themselves. Not everyone is ready at 18 (or 19, or 20...) so I think that one of the primary judgements made needs to be about the prospective missionary themselves - are they really physically, mentally, and spiritually prepared to serve. I'm worried that 18 will become the new "norm" and any male not serving at 18 will be thought less of. Trust me this will happen. 2 - Females and missions. Changing the age obviously opens up the opportunity for a huge population of girls. I have already seen posts from excited YW leaders about how they can now stress missionary work so much more and start preparing girls for missions. 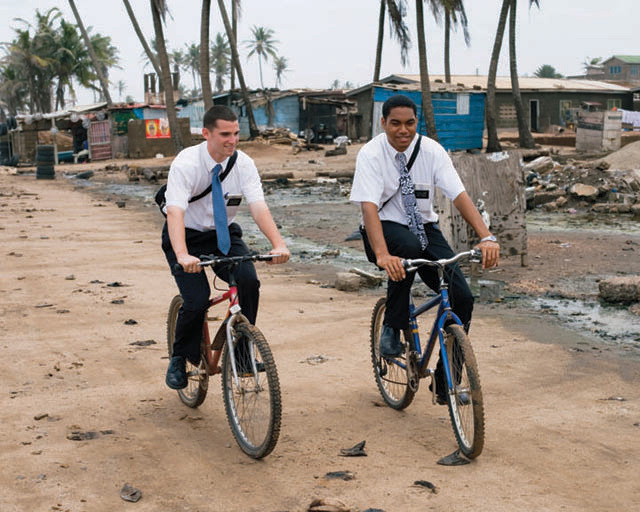 Clearly these people aren't listening to what was said-- that Missionary work is a PRIESTHOOD responsibility. It is NOT a mandate for females. There is no question that great blessings can come to the women (and families of women) who serve missions--but they are under no judgement for NOT serving. I fear that this mentality is going to shift in the wrong direction with this new change and women will be looked down on for not serving. I'm definitely worried about the norm changing. Pres. Monson stated clearly that the age drops are options, not requirements, and Nelson really emphasized the Priesthood responsibility in his talk shortly after the announcement. I am excited that more girls will get to go, but I know that missions are not for every girl. I sincerely hope that no girl who doesn't feel the need to serve will go just because she feels pressured, but we all know things don't go as planned. There will always be unintended consequences. I loved and completely agree with Elder Holland's quote: “Personally I am absolutely delighted that this change in policy allows many, many more young women to serve.” This is so huge for missionary work! It is absolutely true that some areas/people just need sisters. It isn't as common in the US to have elders and sisters in a ward so I'm hoping this change will make that possible. Eric commented that with elders and sisters being so close in age the "mothering" that often occurs from sisters won't be so obvious. Eric also said that more people may end up marrying their "high school sweethearts" because they'll both get home from missions around the same time and won't have dated anybody else. I had that same thought as Eric, and so did Casey. Ha! I totally agree, missionaries will be headed out in droves! I was super excited for this announcement. I love the idea that more women will be able to serve; sister missionaries were invaluable in my mission. I keep trying to find time to watch Elder Holland and Elder Nelson's press conference that they gave on the subject (the video of which is posted on the same Newsroom site you linked to above), but I still haven't yet. I'm a fan of this coinciding with an alteration in YW/YM curriculum. Marriage need no longer be the ONLY end goal or post-YWs event in the narrative of a young woman's life, as marriage is not the only end goal presented to young men. Instructors and leaders can use missionary service as a potential future or hypothetical benchmark as a way to talk about developing virtues, ethics, and behaviors. I think as was mentioned above this can alter perceptions of how necessary our community perceives missionary service for women. But for me, the ramifications of increasing the necessity of an experience that ostensibly focuses on others and service at the cost of decreasing the monolithic and immediate necessity for women to marry immediately out of high school to explore spiritual development and progression--yeah, that's a cost I think our culture can afford to invest in. Yeah! Someone else who saw the curriculum change as the truly life altering event! I think the big gain for every one is that now the YW and YM will both get 6 years of preparation to know and teach the gospel. That will be a benefit to the church, whether that young person serves a mission or not. 6 years is 1/3 of your life at 18, and all of that time will be devoted to gaining a testimony, and then sharing it!